Carpeting is the traditional choice for trade show floor coverings, but does it offer rustic charm? 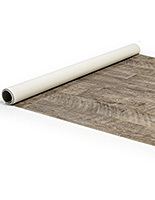 Rollable vinyl flooring with natural wood grain and texture does! Thanks to advanced printing capabilities and embossing techniques, these rolls provide the warmth and style only hardwood can deliver. Custom Flex PacknGo rollable vinyl flooring is portable and comes with everything you need to cover a 10' x 10' booth. The tough, flexible material lays flat and stays flat. Built to perform, this resilient sheeting is dimensionally stable and designed to be easy to clean. Instead of carpeting, add elegance and warmth to your booth with realistic wood-grain rollable vinyl flooring! When it comes to exhibiting at trade shows or other temporary events, comfort has to be taken seriously. Salespeople employed by the company are on their feet for the duration. 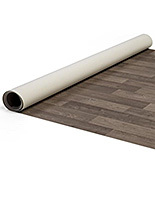 Each roll of vinyl flooring comes with cushioned padding in order to provide a more comfortable working environment. The same is true with the people attending the show. On their feet all day, attendees will also appreciate the extra cushion placed underneath your portable floor. What comes with every Custom Flex PacknGo set? 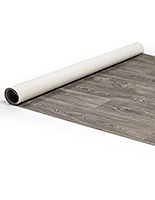 Each rollable vinyl flooring package includes two 5' x 10' rolls (for easier portability). Layed out side-by-side, the .094" thick material fully covers a 10'x 10' booth. 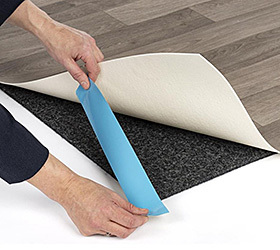 1/4" thick anti-fatigue padding for comfort and 1 roll of double-faced releasable tape are also included. The entire vinyl flooring set is stored in a wheeled, rotomolded transport case. High-quality woodgrain patterns do an excellent job of replicating the look of real wood. Specialized embossing technology creates raised texturing you can feel! 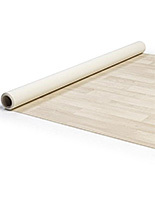 The surface of the rolled flooring repels dirt and provides stain protection as it is 100% water resistant. When installed over a smooth, hard floor, the vinyl will resist scuffs and scratches (Indoor use only). The trade show floor might be considered an afterthought, but it has as much of an impact as any display inside your booth. By choosing realistic rolled wood flooring, there is an immediate effect felt by those who walk on it. Instead of plain carpeting, the look of hardwood adds character, charm, and elegance. It gives the impression of walking into a real store — an advantage especially if you are selling products instead of services. These natural textures will frame and present your merchandise with an exhibit worth entering! Looking for even more trade show flooring options? Lightweight interlocking foam tiles also feature woodgrain finishes as well as bright colors!